Corinne is using Smore newsletters to spread the word online. Read on for details about what is happening in our world! Thank you for the AMAZING luncheon! Thank you to all of you for the delicious lunch. We SUPER appreciated it. What a wonderful treat during such a busy time of the year!! Also...there's nothing like a fantastic lunch with incredibly hospitable Kindergarten parents as the hostesses! Our lunch was the talk of the whole school. Way to represent Kindergarten!! We appreciate you all. Our Class is filled with Great Readers! 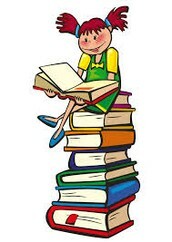 Reading Logs for April are due today, if your child did not bring their log - please send it on Monday. You will not receive a Reading Log for the month of May, but I do hope you continue to read all month long and continue to take AR tests in preparation for first grade. I will be looking to see who in our class reached our April AR Goal! These students have earned a Dress Down Day and a Frozen Treat on Tuesday, May 5th! You will receive a separate e-mail from me if your child reached their goal - I will send these out on Monday! Our Reading test went very well. All of the network issues we seemed to have had the last test have been 100% resolved and the kids did a wonderful job during our testing session! Everyone was eager to find out how they did and I could not have been more proud of the results I was able to see. When school wide MAP testing is finished, results will be shared with everyone! We will have a regular week of class next week and we will take our Math MAP test on May 12th. Homework Packets are always due on Monday! Please make sure your child brings their Homework Packet every Monday in order to earn credit for their hard work. Show-And-Tell and Prize Box are on Wednesday! This week please bring two objects that can fit in the palm of your hand. We will be using our balance scales to estimate and test which object is lighter and which object is heavier. 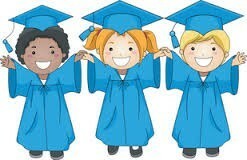 Kindergarten Graduation is Wednesday, May 20th at 6pm in the cafeteria. Plan on the program lasting until around 7:15pm. Ahhhh….graduation. A time to celebrate the end of a fantastic year, and the start of new beginnings. Let us just say that we are just as excited for the opportunities that await our young scholars, as we are saddened to see them move on. Graduation is definitely an event not to be missed, so I hope all of your family and close friends plan on attending! Please bring your child to my Kindergarten classroom to dress in cap and gown by 5:30 pm. Girls should wear dresses or skirts and boys should wear nice pants (not jeans or sweatpants). This is so the clothing we see under the gowns looks nice and fairly consistent. With the exception of refreshments for the audience, dinner will not be provided. However, there will be plenty for you to view while you wait for the show to begin. Ensuring you get your graduate to us by 5:30 pm is where your responsibilities end. We will take care of dressing the students. Relax, sit back, and enjoy the show! Want to help volunteer your time or materials for the biggest event of the year? Be on the look-out for a sign-up genius link to be sent out by me by next Friday. How cool is the flyer that came home this week? Everything your child needs for a successful 1st grade year has been hand-picked for you already. All you need to do is pay $138.81 and return your child's order form in their folder by May 8th! Mrs. Crigler worked closely with all of us (faculty) several weeks ago to put this together and find the best value products for the items requested by teachers. 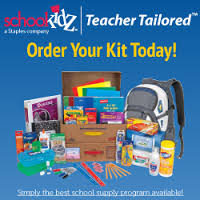 Avoid the craziness of back-to-school shopping in August and get it done now by ordering through Schoolkidz! Last month to be a Mystery Reader! Our Kindergarten year is almost over! Come be one of our Mystery Readers! There is a Mystery Reader sign up outside our classroom door for this semester. Please consider volunteering one Friday this year to come visit our classroom and read to our Kindergarten class. They LOVE when we have special visitors :-) If you are unable to come into the school to sign up, please send me an e-mail with a Friday that you would like to volunteer for and I can sign you up! This semester you can choose to read at 8:00am or at 3:00pm on Fridays. Please circle the time you would like to read when you sign up for a date. Square 1 Art Orders End at Midnight! I don’t know if you noticed the adorable handprint art that came home in your child’s folder, but today is the last day to place your order if you wanted to get your child’s artwork printed on something like a mug, magnet, or mousepad! You can order online or over the phone until midnight on May 1st. ORDER ONLINE using the link below. Create an account using the unique access code located on your free stickers. You may also contact Square 1 Art Customer Care at 888.332.3294 or online chat for your access code. I will be offering end of the year Spring Conferences if you would like to meet with me. This is only if you want to meet to discuss. Many of our families regularly have conversations with me about their child's progress, so they may feel like a conference is not necessary and that is okay! This is an option for you to meet with me if you feel like it is needed. If you do.. please let me know which date and time you would like to meet. This will be on a first come, first served basis. Send me an e-mail with your preferred date and time and I will let you know if that time is still available. On Thursday of this week we will have STEAM Day at FSAPS all day long! Our day will be filled with fun Science, Art, and Math activities. It will be a great day at FSA. Reading and Language Arts: In Reading and Language Arts this week we will practice all of the skills we have covered in Kindergarten using a variety of Small Group activities. We will revisit the story elements: main idea, setting, problem, solution, conclusion, characters... We will also practice our language skills: writing proper sentences, capital letters, punctuation, nouns, verbs, and adjectives. On Friday, we will take our Unit 5 Benchmark Assessment for our Reading Street curriculum! This will be the last Unit Assessment we take in Kindergarten for Reading and Language Arts. Social Studies: In Social Studies this week we will take our Chapter 5 Assessment and complete our My World Social Studies curriculum. We have reviewed these concepts all week long, so I know your Kindergarten students are ready for their assessment on Monday! Math: In Math this week, we will continue to review the skills covered in Chapters 15-20 with a variety of Small Group games and Activities. On Friday, we will take our last Math Assessment! For the rest of the year we will be learning and practicing First Grade skills like time, fractions, and more complex adding and subtracting. May 22: Last Day of School and Summer Birthday Party!